Living Authenticity: Who Are You Unfolding to Become? When I was young, I frequently thought about what I wanted to be when I grew up. In middle school, I wanted to act. In high school, I considered veterinary medicine. Aside from doing a little community theater in my early adult years, and subsidizing every vet clinic within my vicinity with the care of my fur babies over these many years, those career options came and went by the wayside. After college, I graduated with a degree in political science and got the first job I could find: civilian with the Department of the Army. I never considered who I was becoming because at the time, I was more focused on doing. Fast forward almost three decades, and I’m in a very different place. A place of curious comfort. Comfortable in my sense of peacefulness yet ever curious for what comes next. But I didn’t get to this place by doing; I got here by learning how to be — by mindfully seeking out my authentic self and trusting myself to unfold into that realization. And yes, it took almost thirty years! Michael Bernard Beckwith says that we can be active participants in the evolution of our lives — the unfolding of who we become. To do this, however, we must first know who we want to become. More importantly, we must make an emotional connection to that part of ourselves by asking “why” and then resonating in that answer. Successfully unfolding into your authenticity means you must truly desire the very manifestation you wish to create. For example, let’s say you want to become a lawyer. When you ask yourself why, you respond with, “Because that’s what my mother does and what my parents expect me to do as well.” If you are following a path that someone else has laid out for you and it is not a destination of your choosing, while you may follow the path to it’s natural conclusion, chances are you will not be happy. Seriously. Everything you need to know about your life is contained within your emotional guidance system. If you feel incomplete, then look at all the areas of your life to determine where the gap might be. Consider the emotional, spiritual, social, financial, familial, physical, mental, and career aspects of your life. Sit with those considerations and then on a scale of 1 – 10, with 10 being awesome, how would you rate your happiness and satisfaction in each of those areas? Now, consider that each area represents a spoke on a wheel and the number you identified on the scale indicates the length of the spoke. How smooth would your ride be? What aspects of your life might you need to focus to gain an increased feeling of balance? Whether your litmus test of feeling signifies you would feel happier with more friends, or you need to release an unhealthy relationship, change is required. And of course, change creates resistance which makes changing all the more difficult. We all know that change takes courage. Lots of courage! If the goal is to get to a better feeling place, then your honest answer to that question is key. It points you squarely in the direction you need to go. When and if you decide to create a change in your life, those around may not be very supportive. Don’t let that surprise you. They are uncomfortable because your change creates implications of change for them by default. And, no matter how thoroughly you try to explain yourself, they may never stand behind you in the way you would have wanted. That’s okay because you are in charge of your happiness, and only you know what it takes to live authentically, following your dreams. If you take a moment right now to consider all the aspects of your life, what one area could benefit from your focused attention? What aspect of your life is overdue for growth, development, challenge, and adventure? Finally, what is the first next step you can take for the unfolding of your authenticity to take shape? Now that you know the answer celebrate by jumping forward with both feet and never looking back! 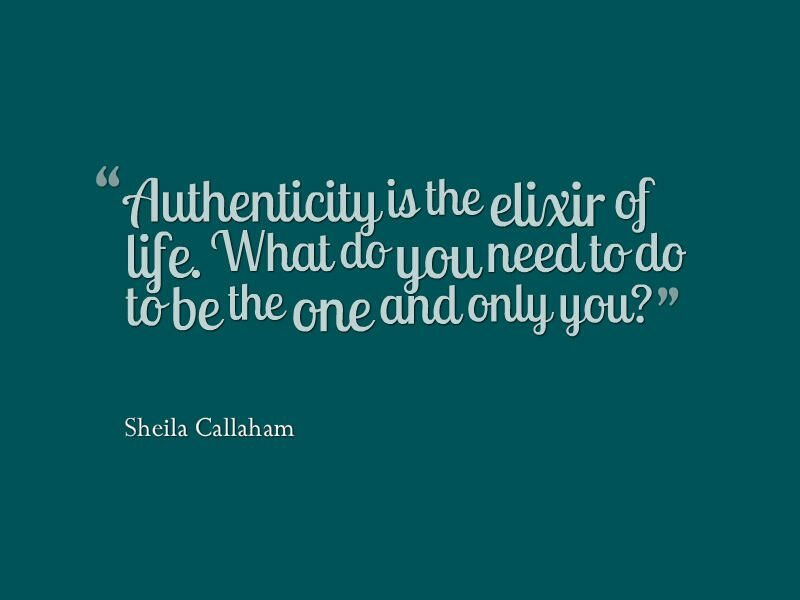 Go on, drink the elixir of authenticity. It’s the best drink you’ll ever have. Sheila Callaham is an author and success coach living in Chapel Hill, NC. If you liked this article, please share via your favorite social media venues. Sheila loves being social! Before you go, join my newsletter at the top of the post for intermittent updates. You’ll be the first to read about new book releases, free giveaways, and special coaching packages.